Gorgeous mountain home with enough space for a large extended family or group of friends. Featuring 3 bedrooms and 3 bathrooms with two living areas. Front driveway offers ample parking space for multiple vehicles. Enter through a lovely wrought iron gate into a private courtyard. The living room is large and beautifully furnished with a built-in sideboard, skylight and wood burning Kiva fireplace. The second living area (den) offers additional sitting with a sleeper sofa and built-in twin beds and a big screen TV. Off the den, a separate covered portal creates additional space for solitude and relaxation. One bedroom has a queen bed with separate bath; the master suite has a king bed, a Kiva fireplace and the bath has a walk in shower and a lovely vessel sink. The white tiled kitchen is bright and inviting, with gas cooking, and a breakfast bar adjacent to the dining room. Open the double doors of the dining room and enjoy a covered deck with dining area. 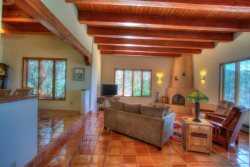 Continue to an expansive deck that boasts some of the most spectacular views and western sunsets in Santa Fe. Soak in a hot tub near a patio area with chairs around a terracotta chimenea (fireplace). All of these amenities and only a 5-minute drive to the Plaza. Book a stay today as this home will fill up fast! Surveillance or recording devices on the property - Cameras located on outside near entrance and on side door bell.